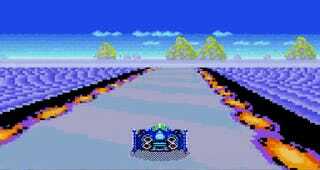 F-Zero was a flagship game for the Nintendo's Mode 7 graphics option for the SNES, a game that should be impossible to replicate on a Genesis. Of course, intrepid fans have found a way. In case you've forgotten, Mode 7 allowed developers to scale and rotate backgrounds layers to create a psuedo-3D effect. It's what allowed F-Zero and Super Mario Kart to exist before we'd developed proper 3D video games. Essentially, Mode 7 deploys a very effective visual trick. It remains a pretty impressive-looking game, right? Hi, this is a demo of rotation and scaling better known by the name of "Mode 7". I'm using the external Ram 64Kb in Word mode, to use as a "virtual map" of 256 x 256 8bit (256 colors "simulated" as in Wolf3D), the idea is that when we move on the map, it will uploading new "tiles" (a size of 8 x 8 = 64 bytes), similar to what is done for normal scroll, but as "tiles" of 64 bytes. Unfortunately, this will not work with flashcarts, since they do not support word-wide in Sram. It's not quite F-Zero on the SNES, but it's surprisingly close!